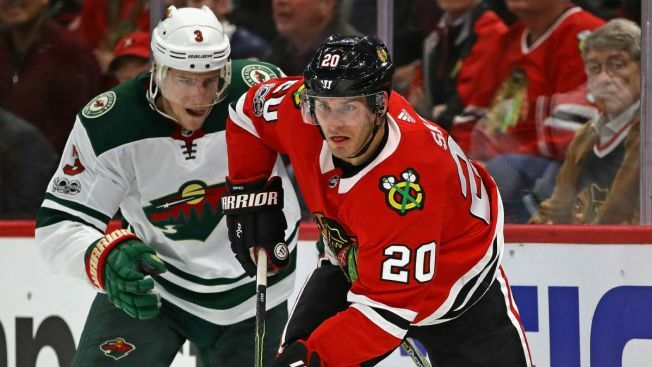 The Chicago Blackhawks are looking for their fifth win in a row on Sunday night when they welcome the Minnesota Wild to the United Center. The Blackhawks are currently tied with the Wild for the second wild card spot in the Western Conference, and will be looking to pick up their second straight win over a divisional opponent after throttling the Winnipeg Jets 5-1 on Thursday night. During the team’s winning streak, the top six forwards in the lineup have really picked up the slack. Patrick Kane has two goals and three assists over that span, and Jonathan Toews and Brandon Saad each have a goal and two assists in the last four contests. Nick Schmaltz also has a pair of goals and notched one of the most spectacular assists of the season as he spun around and fired a no-look pass to Kane during Thursday’s win over Winnipeg. The Blackhawks have also been getting strong goaltending from Corey Crawford, who has given up six goals in four games since returning from the injured reserve list. He has a sparkling 15-7-2 record with a 2.15 goals against average and a .934 save percentage so far this season, and is putting himself firmly into the Vezina Trophy conversation. Even with all the success they’ve had recently, the Blackhawks still have a long way to go to reverse their fortunes against the Central this season. They have split their games against the Wild, but are just 3-5-2 against the Central Division so far this season. The Blackhawks haven’t exactly had the best power play in the NHL this season, but the Wild are struggling mightily as well, scoring just once in their last nine games on the man-advantage. They are a combined 1-for-19 in those contests, and although they have won four of their last five games and six of their last eight, it hasn’t been because of their special teams acumen. The Blackhawks will need to carry over their strong effort on the forecheck from Thursday night’s game, as they gave the Jets fits throughout that game. Brandon Saad and Tommy Wingels were key to that attack, but even players like Kane and Alex DeBrincat were getting involved frequently on the defensive side of the ice. Puck drop is scheduled for 6 p.m., and the game will air on NBC Sports Chicago.